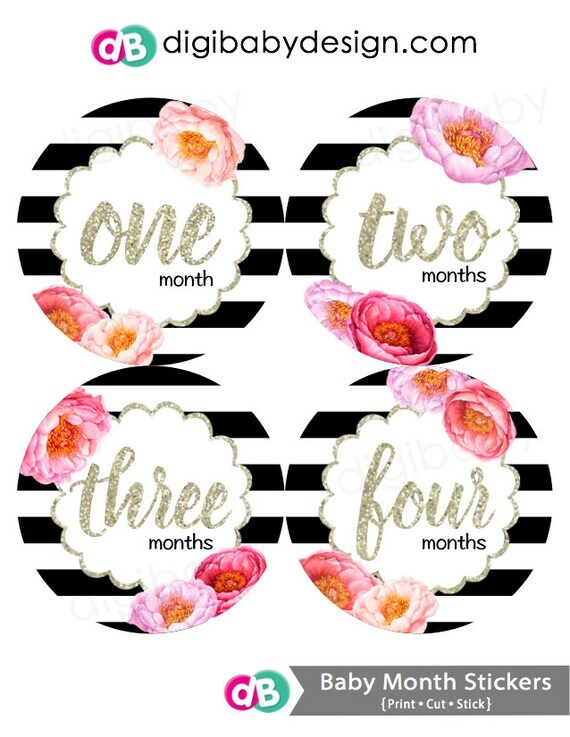 Baby month stickers are a cute way to document your baby's growth through the year. They look absolutely adorable for pictures and make fantastic baby shower gifts for that mother-to-be! INSTANT DOWNLOAD listing is for 3 high resolution PDFs that each contain 4 stickers per sheet. Each sticker is 4” in diameter. So easy to use!! Just print the files onto letter sized (8.5x11) white label paper, use a scissors to cut the circles out, stick onto an infant bodysuit, t-shirt, chairs etc..., and take photos. Save in a photo album or scrapbook. They make for excellent quick inexpensive gifts. If you have any questions please Convo me on Etsy, I would be happy to help you in any way! ♥ All of my designs are for personal use only, not for resell. DigiBaby design retains all rights.